I usually try to make a dinosaur cake for all my kids birthdays but I was pressed for time this year. This has got to be the easiest decorated cake I have ever made. I baked a 9 x 13 white cake with white cream cheese frosting. 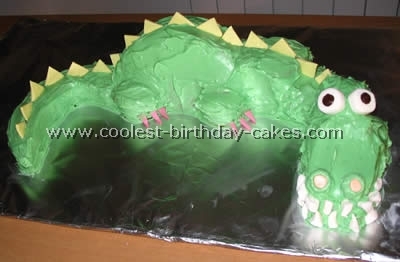 I found a picture of a dinosaur that I liked out of a coloring book and traced it on to regular paper and then cut out the dinosaur and discarded the actual dino shape and kept the outside of the paper to make a template and laid it on top of the already frosted cake and used green spray frosting to "paint" the dino shape onto the cake. Then I went over the outside edges of the dino in regular frosting that I dyed blue to make an outline. (The edges of the green paint were blurry without adding an outline.) Then I added some blue and green M & M’s to accent his spikes. 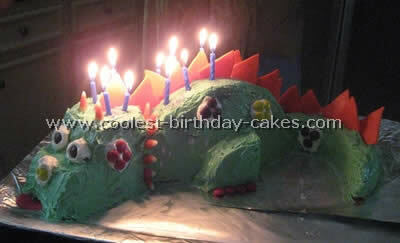 I made this dinosaur cake for Kevin’s fifth birthday. The other tips were great, basically did the same thing. I made brownies and used that for the legs. They were more stable than the cake. The little fruity banana things worked great for his toes. Kevin wanted to use them for the eyebrows which surprisingly looked cute. I used Nestle Crunch Sticks and green Sour Strings for the palm tree. I suggest making the palm tree right before serving (sour strings break and get droopy). I’ve never taken any cake decorating classes but some day I hope to be able! We have four kids so we cannot possibly afford those expensive bakery cakes! 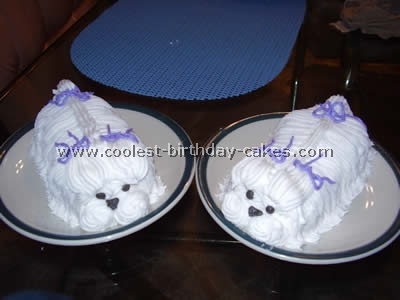 Out of necessity I have been trying to learn how to decorate cute birthday cakes. 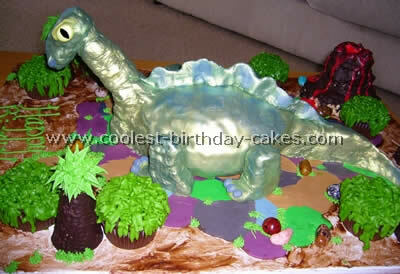 I ordered a dinosaur cake mold off eBay and I started looking for cute dinosaur cake ideas. My son loves the green T-Rex looking dinosaurs so I chose this pattern for his cake. I prepared it using one box of yellow cake mix. I invested in a few different cake decorating tips. I usually use #18 to make the large star shaped patterns all around. I pipe in the outline then use the star tips to fill it in. It’s always fun to experiment with colors and cake tips. You can always scrape it off and start over. I made this dinosaur cake by using a pound cake mix from a box (even though people had said not to use a mix, this worked fine). I used frosting from a can which I regret because it wasn’t stiff enough to hold any of the star shapes that I wanted to put on it. I basically just used two 9" round cakes. The first I folded in half to make the body. The second cake I cut out a crescent for the tail. Then I cut out two u-shaped pieces (with flat bottoms) and also cut out their mirror images. This made the head which was actually two levels: one for the snout and the other for the eyes. The rest was easy; I just cut out little wedges where I needed them and two paws. There was cake leftover. 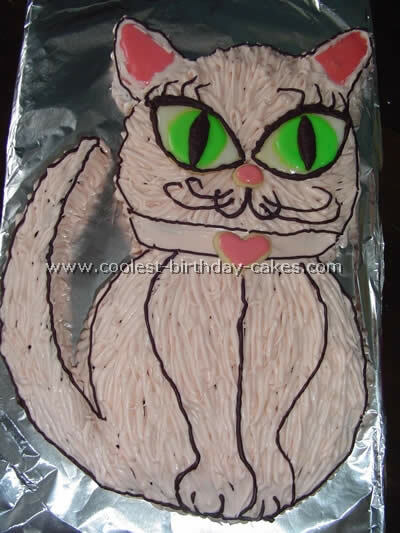 I frosted the cake and used extra white frosting for the eyes and nose. I used triangle-shaped fondant for the spikes as well as candy corn. In total this took about five hours including the baking time but I was taking my time doing it. Cake by Maureen M., UK. 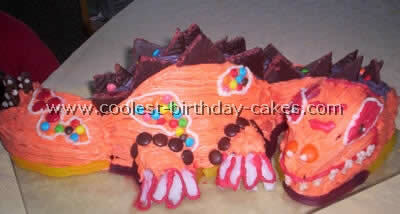 Thanks to your website I used some ideas from other people who had contributed a dinosaur cake. I used a round sponge cake cut in half and stood on cut edges for the body. Then cut shapes from a square cake for head, tail and legs. I used green ready roll icing and decorated with individual Toblerone pieces for the spikes, large chocolate buttons for spots and Cadbury’s crisps for ruff. My two year old twins are really into dinosaurs right now so we made a dinosaur cake for fun. This is a basic yellow cake with thick chocolate frosting. I used water on my hand to make top smooth. Then I used a butter cream frosting with food coloring. My son is right into dinosaurs at the moment. 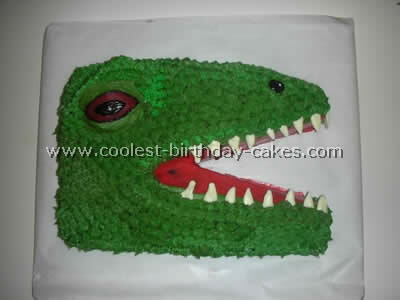 So I was lucky when I came across this site and found a dinosaur cake. in return I’m posting his cake. I used two 9inch round pans. After the cakes cooled I cut one in half then flat sides down joined them together with skewer sticks. The second cake I divided into thirds crescent shaped. One for the tail and the other two I stacked on top of one another joining them with skewers. I then cut on an angle from the top of the head to the end of the nose. Then using some of the off cuts, apply to the area that would be the eyes. I then made frosting from a recipe on this site. I set some aside for the purple backbone. I tinted yellow and red to get orange. Lightly spread some on and put in the fridge to set. I used mini cherry ripes cut in triangles for spikes, some M&M’s for markings. I put snakes around the bottom. Chenille sticks cut for toes. Then use cake mate decorating icing in a tube (red & white) to pipe the finishes around the toes, mouth and teeth. I started with two 8" rounds. I cut one of the rounds in 1/2 for the body. The other round I cut into shapes for the tail and the neck of the dinosaur cake. I used small cupcakes cut in 1/2 for the legs. It was really fun to make-and it turned out wonderful. This was the first "fun" cake that really turned out nice. 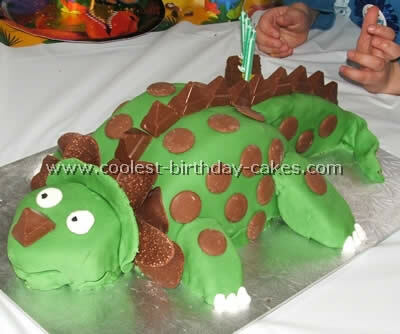 I liked the dinosaur because it didn’t have to have smooth frosting, instead I made scales. Whether you are making a dinosaur or anything else… the most important thing is to have fun! 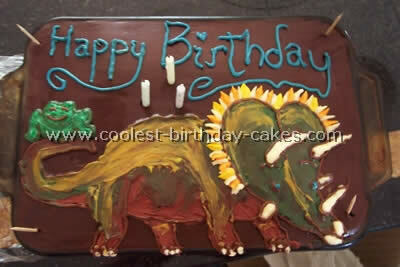 This dinosaur cake was made for a four year old boy’s birthday. He wanted a dinosaur and a volcano. The volcano, neck and legs are made out of Rice Krispies. The volcano is covered in chocolate and royal icing tinted red. The bushes are cupcakes topped with green butter cream and the "trees" are chocolate coated sugar cones with royal icing tops. The marbled ground is fondant or roll able icing. The "rocks" are gummies and the dirt-like brown color is chocolate icing. The entire thing is edible except for one wooden rod holding up the neck and four toothpicks holding up the spikes on the dinosaur’s back. For his fifth birthday party my eldest son wanted everything to be about dinosaurs. 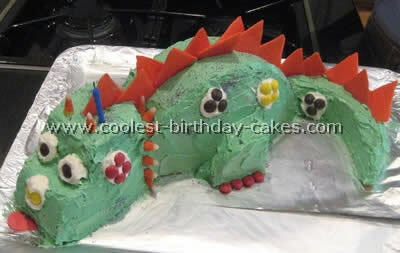 So naturally that included me making a dinosaur cake. I mainly used the ideas from this web site especially the dinosaur hand-drawn template which made it easier for someone like me who wants to picture each step before starting. I used two boxed cake mixes and three store-bought cans of vanilla frosting tinted with green coloring (simplify as much as you can!). With the first I made two round pans (9") and the second I made into cupcakes. I only really needed four cupcakes but then we just frosted the rest, stuck plastic dinosaurs on top and brought them to his Sunday school class the next morning. 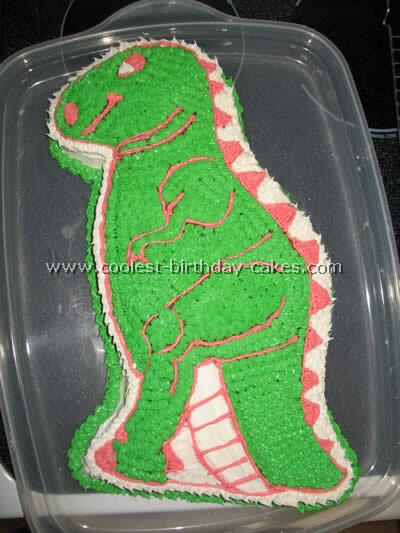 Mainly I followed the template on this site for a dinosaur cake. I used half a cupcake for each leg/foot and two whole ones stacked on top of each other behind the snout area to give the dinosaur more of a head. In the past I have tried doing shaped cakes and the crumbs mixing with the icing were always a hassle. So I tried to keep the non-crumby sides facing out when possible. The decorations are mainly a Starburst-type chewy candy that I used my rolling pin to roll flat and then a pair of scissors to cut into various shapes: orange into circles for the two nostrils (on top of two finger-full-dollops of icing) pink into skinny triangles for toenails and yellow into squares that got inserted diagonally all along the dinosaur’s back poking out as triangle spikes. The eyes and teeth on the dinosaur cake are large marshmallows. For the eyes I melted a couple of chocolate chips and used a toothpick to "paint" on the marshmallows. For the teeth I again used the scissors to cut the marshmallows into triangles. It came out pretty good. Looking back at the photos I now think it looks more like an alligator or a dragon but I suppose context helps. The most important thing was that my son loved it! 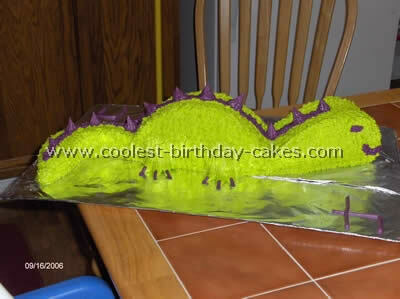 This dinosaur cake is a two layer 9×13 chocolate cake. I made a single chocolate cupcake with the batter to make the eye dimensional. After cooling the cakes and filling it I stuck it in the freezer briefly to aid in cutting it. I did everything on parchment paper to make it a bit easier to arrange the cake. After chilling I cut the cake at a slightly off diagonal. Do not cut corner to corner the nose is too pointed. I then slid the "jaw" off the parchment and flipped it over. A triangle of cake must be cut away to fit the lower jaw on. An angled cut on the inside of the lower jaw opens up the mouth. The top of the cupcake was cut off and fixed in position and scrap was used to give dimension to the brow. Angled cuts contoured the head. The cake was chilled again. Starburst candies were warmed slightly and rolled out between parchments then cut with kitchen shears to make the interior of the mouth and the red eye. Butter cream frosting was used. Green food color was used and Wilton brown was added to create a darker color. I didn’t mix the brown in very thoroughly so that there would be variation in the color. I didn’t want it to be too look natural not comic. 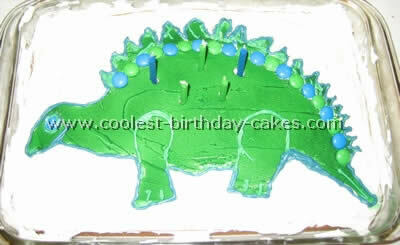 The interior of the mouth and the eye of the dinosaur cake were placed on the cake and tacked in place with frosting. I then frosted around the eye with a flat tip. The remainder was covered in stars including the sides. I found this to be the easiest way to cover the tricky cut edges without crumbs. Accent to the eye was done in Williams Sonoma decorating pen in black. Teeth were made with Williams Sonoma decorating pen in white. Teeth were made on parchment paper and chilled to harden and then placed on the cake and seated in the frosting. My little guy is very satisfied with the results. My son wanted a Dinosaur party for his fourth so my mother-n-law and I went to work on a dinosaur cake. I used inspiration from this website to create his cake and my mother-n-law decorated it. I baked a heart shaped cake first, cut it in half and iced it together on it’s edge for the head…then a round cake cut in half and iced together on its side for the body…then out of a sheet cake I free-form cut a crescent for the tail. We used fluorescent food coloring to create a bright green and purple dinosaur. After she completed the icing on the cake using a star tip she went back and used icing to form the feet along with the purple toe nails. 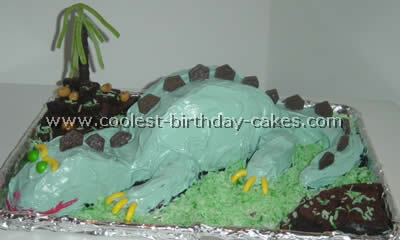 It took us a while to make the dinosaur cake but it was well worth it!